In 2008, among U.S. workers, 5,071 died from occupational injuries, 3.7 million suffered serious injuries, and 187,400 became ill from work-related exposures [BLS 2008]. The estimated annual direct and indirect costs of occupational injury, disease, and death range from $128 billion to $155 billion [Schulte 2005]. While the underlying causes vary, a recent study implicates design in 37% of job-related fatalities [Driscoll et al. 2008]. 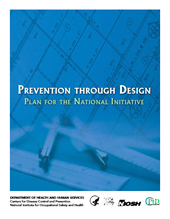 Thus, to protect lives and livelihoods, stakeholders across all industrial sectors of the economy need a comprehensive approach for addressing worker health and safety issues by eliminating hazards and minimizing risks to workers throughout the life cycle of work premises, tools, equipment, machinery, substances, and work processes, including their construction, manufacture, use, maintenance, and ultimate disposal or re-use.